Turkish rabbi of the seventeenth century; born about 1568; died in 1658. He was a pupil of R. Samuel Ḥayyun, author of the responsa collection "Bene Shemuel," and probably of R. Solomon b. Abraham Kohen (MaHaRSHak) also. As the director of the yeshibah of the old Lisbon community of Salonica he gathered about him a large number of devoted pupils, many of whom subsequently became well-known rabbis, among them Aaron ben Isaac Lapapa, author of "Bene Aharon." Motal was the author of many responsa and decisions, which were included in other works, e.g., in the "Bene Shemuel," in the collection of decisions by R. Ḥayyim Shabbethai (part i., Salonica, 1713; part ii., ib. 1715; part iii., ib. 1718) and the same scholar's responsa (ib. 1651), and in "Bene Aharon." 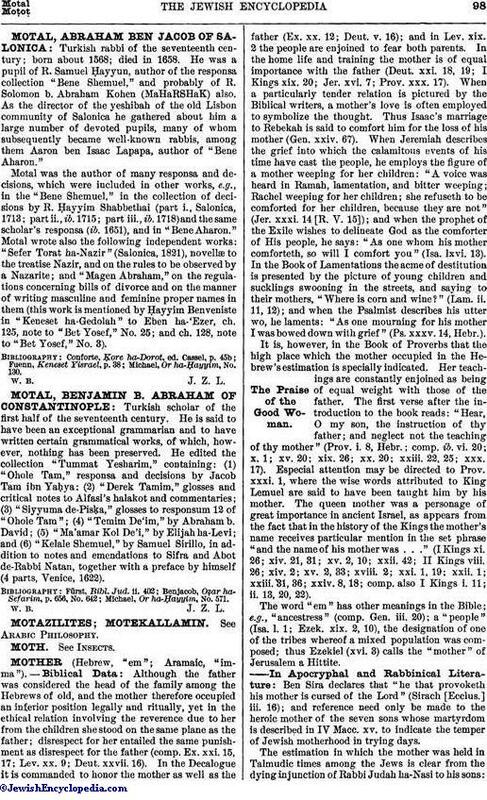 Motal wrote also the following independent works: "Sefer Torat ha-Nazir" (Salonica, 1821), novellæ to the treatise Nazir, and on the rules to be observed by a Nazarite; and "Magen Abraham," on the regulations concerning bills of divorce and on the manner of writing masculine and feminine proper names in them (this work is mentioned by Ḥayyim Benveniste in "Keneset ha-Gedolah" to Eben ha-'Ezer, ch. 125, note to "Bet Yosef," No. 25; and ch. 128, note to "Bet Yosef," No. 3). Michael, Or ha-Ḥayyim, No. 130.